“Every Vow You Break” is the second novel by Julia Crouch and just like her debut “Cuckoo” it’s another dark and creepy read. Lara Wayland and her children sixteen year old twins Olly and Bella and four year old Jack give up their lives in Brighton to move to Trout Island, a small rural town in upstate New York to accompany her husband Marcus as he has been given the opportunity of a lifetime giving the main role in “Macbeth”, in the town’s local adaptation. Lara hopes with the move, it will her help her rekindle her failing relationship with Marcus and help her recover from the abortion that Marcus insists she had. But on a freak meeting at the plays opening night, they meet Stephen, an old friend of Marcus’. Stephen is everything Marcus isn’t, attractive, considerate, successful and interested in Lara. It’s not long until Lara realises that she too is interested in Stephen and feels drawn to him. As she begins a dangerous game, she is unaware that her every move is being watched. OK, I’ll be honest. This book creeped me out. But if it’s possible, it creeped me out in a good way, meaning. I couldn’t put it down. For the few days it took me to read it, I found myself looking over my shoulder, as I too felt like I was being watched, as I joined Lara on her risky adventure. From the very moment the Wayland family land in Trout Island, it is obvious that things are far from normal in the rural town, with the vivid descriptions of the derelict rundown surroundings that wouldn’t look out of place in “Dawn of the Dead” movie to the zombie like people that whisper behind their backs. I particularly found the relationship between the twins most disconcerting, as Bella befriends one of the local boys Sean, Olly’s obvious jealousy and dislike for the boy is rift throughout the chapters which can sometimes border on uncomfortable reading. Throughout the book there is a constant sense of unease, as Lara is faced with situations of things going missing or feelings or being watched. “Every Vow You Break” is an intriguing read that draws you into the dark world of Lara Wayland and her troubled family from the start. It’s mystery and suspense seeps from each page, making the readers skin crawl with suspicious characters and uncomfortable situations that makes even the most bravest of people glance fearfully over their shoulders. With a wonderfully dark cover of an over turned chair at the porch door, which gives the reader a taster of what the book has in store in them and also warns them, that it is not for the easily scared. 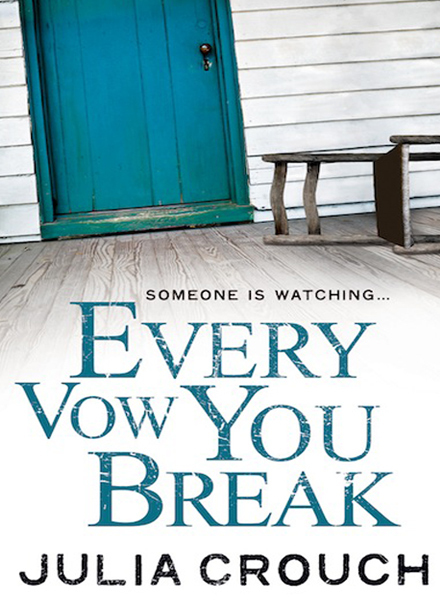 A dark, gritty and most of all sinister read, “Every Vow You Break” is an addictive page turner. You can buy Every Vow You Break on Amazon and other good bookshops.